Thunderbird is a free, open source e-mail client developed by Mozilla, the producers of the Firefox web browser. Thunderbird has a rich set of email management features very similar to Microsoft Outlook and can be used with either Windows or Mac. Whereas Outlook must be purchased, Thunderbird is completely free. An increasing number of Outlook users are switching to Thunderbird for similar reasons that so many have shed their Microsoft Internet Explorer browser in favor of Mozilla Firefox. First launched in December 2004, Thunderbird was downloaded more than 1,000,000 times in it’s first 10 days of release. To download Thunderbird, go to http://www.mozillamessaging.com . To install Thunderbird for Windows, simply click on the “Download Thunderbird Icon”. If you are using Mac or another operating system, or you want to install Thunderbird in a different language, click on the link below the icon, “Other Systems & Languages” . 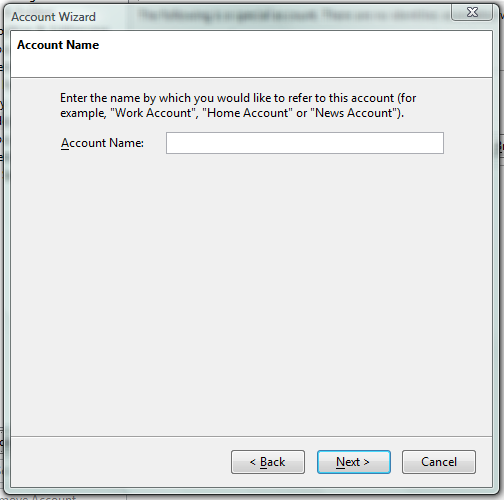 After you’ve finished downloading and installing Thunderbird, you’ll be prompted to setup a new account to get started. 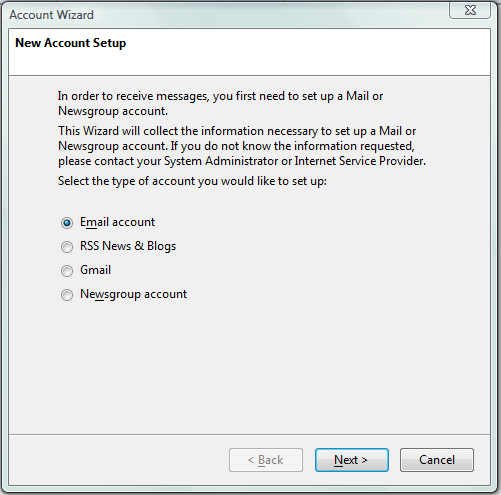 For the account type, select Email Account and then click the Next button. 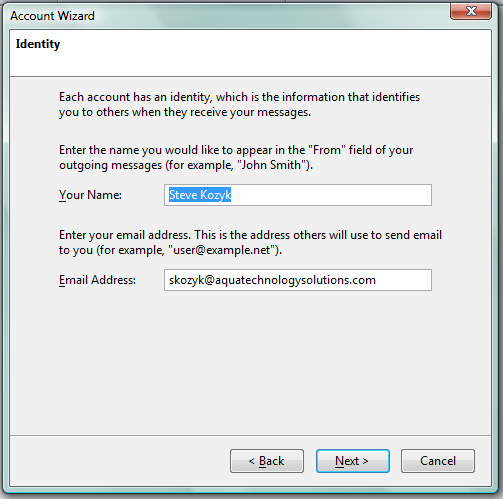 On the Identity screen, enter your name the way you want it to appear for recipients of your email. Next enter the email address you are setting up in Thunderbird. 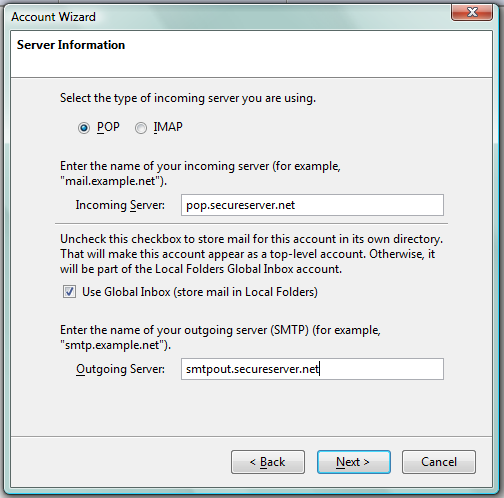 On the Server Information screen, choose your server type and then enter your incoming and outgoing mail server names. Next enter your Incoming and Outgoing user names. Most email hosts (your email provider) use either your full email address as your user name or just the portion of your email address before the @ symbol. 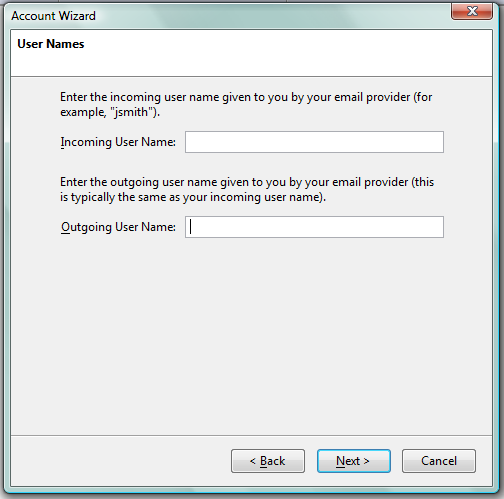 In most cases the incoming and outgoing user names will be identical. Enter the name you’d like your email account to be called in Thunderbird. Many users simply chose to use their email address. Enter your email account password and hit OK. Depending on your email host, you may be ready to start using Thunderbird to send and receive your email. However for some hosts, you’ll need to complete a few more steps. To check to see if you’re able to receive email, click on the “Get Mail” icon in top left corner of the main menu. If everything works fine, you’re all set. If not you’ll need to get more information from your email host. I’ll demonstrate how to set alternate settings for those using GoDaddy. In the Thunderbird main menu at the top of your screen, click on Tools and then Account Settings. 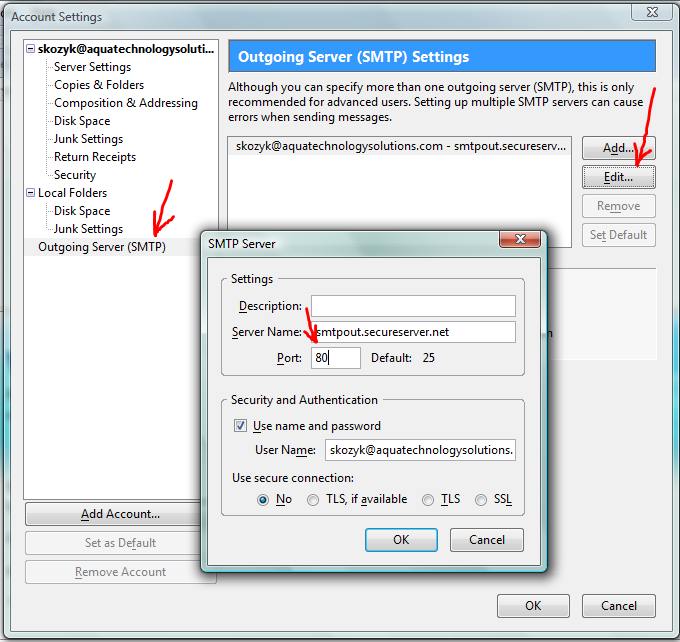 Once the Account Settings dialog box pops up, click on Outgoing Server (SMTP) in the left menu. Next select your email address and click on the Edit button. A new window will appear prompting you for settings. Change the port number from the default of 25 to 80. 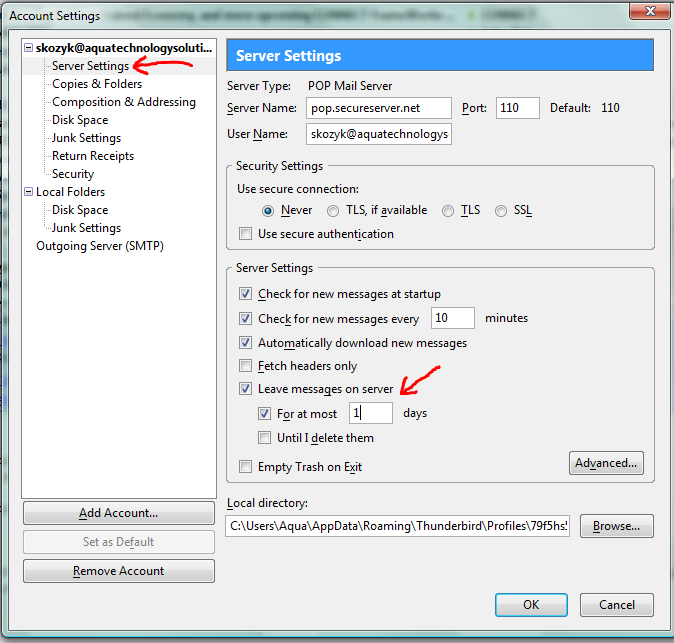 Click OK.
Now choose Server Settings from the left menu. If you want to change how your email is stored on your hosts server you can set the properties on this page. Click on the “Get Mail” icon in top left corner of the main menu and if you are able to send and receive emails, you should now be set up and ready to begin using Thunderbird.